You don’t normally think of the Federation of Master Builders (FMB) as being at the cutting edge of housing policy. Formed in London during the Second World War to lobby for small builders to be able to get bomb damage repair work, the FMB never set its stall out to be more than a reasonably effective trade association. It runs a useful website for people to find FMB builders and has a warranty scheme for people undertaking home improvements. But compared to the likes of the NHBC and the Housebuilders Federation, the FMB has always been a bit of a lightweight. But times change. The FMB have sensed that the agenda may be moving away from the big plc housebuilders and towards the repair, maintenance and improvement (RMI) sector, which is what their core membership do. Sensing that there may well be a lot of work to be done in future-proofing our existing housing stock, they commissioned the Environmental Change Institute at Oxford to write a report called Building a Greener Britain and then put on a launch event earlier this month, the first time the FMB have ever been involved in such a thing. 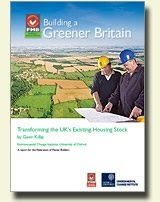 As well as a presentation by Gavin Killip, the impressive author of Building a Greener Britain, they managed to draw both the junior housing minister Iain Wright and the shadow housing minister Grant Shapps. For an organisation with no political track record, this was quite a coup. I was going to write a report about the proceedings but got delayed by one thing and another, not least going on holiday to Greece. And anyway the meat in the sandwich is Gavin Killip’s report and it wasn’t until last week that I got around to reading it and I must admit I am impressed. It’s remarkably free from waffle and it fleshes out the thinking behind 18 recommendations for policy changes that are clearly laid out right on page 6. I won’t list them here — you can download them yourself — but you’d have to be a real nit-picker to want to argue with any of them. The one that the FMB particularly like is No 6, the recommendation that the UK government cuts the VAT rate on RMI work to 5% from its current 17.5%. I didn’t realise that this had been trialled in the Isle of Man, as well as several other EU states, and it results in a higher tax take for the government because fewer jobs get done for cash. If the government wanted to “do something” about cowboy builders (they do) and they want to increase their tax take (they do), then this seems like a no brainer. My one reservation about the proposals is that it makes out that eco-refurbishment is easy and that bringing about 60% or 80% carbon reductions from the existing stock is simple. Despite the best endeavours of Russell Smith of Parity Projects to show how it’s done, I remain to be convinced. In fact, I’ve been thinking about this a lot over the past month and it’s tending to make me a little depressed. There’s a low hanging fruit issue here: there are some actions that are simple and cost effective, and there are some homes where it makes sense to “do the works.” But to make really deep cuts in energy use across mainstream UK housing….that’s going to be a tough nut. On Thursday last week, I was guest of Nick Oldridge of Sandtoft Roof tiles at their Broomfleet plant on Humberside. Nick (pictured here with a yet-to-be fired clay batt) is part of the third generation of Oldridge’s to run this family business and, together with his brother Simon, they have repositioned Sandtoft as a greener and more natural competitor to Britain’s roofing giants, Redland (now Monier) and Marley (now part of Eternit). To get a feel for how and why they felt this was necessary, it’s useful to look at how the roofing business has developed in the UK, and how this differs from the rest of Europe. The favoured roofing material of the Victorians was slate which became widely available across the country because of the canals and railways which forged the industrial age. Clay pantiles were popular in the east of England but most of these were imported from Holland and Belgium, used to fill the textile-laden boats returning from the Continent. It wasn’t until the great building boom of the 20s and 30s that industrial scale roofing manufacturing really kicked off in this country and the material of choice for this roofing boom was concrete. Marley and Redland grew fat producing large format concrete interlocking tiles. Sandtoft was one of the smaller fry riding along on their shirttails. Clay tiles at the time were only produced in small format size which made them both expensive to supply and expensive to fit as a roof cover. They remained a specialist, upmarket niche. But across the Channel, the clay tile manufacturers worked out how to do large format interlockers and, despite several attempts by concrete manufacturers to gain a foothold, clay remains the No 1 roofing material in France and Germany. Concrete is an also ran. Generally, clay is a little more expensive to produce than concrete, but weathers better and is most people’s preferred option where a clear choice exists. Which was why Nick Oldridge took the time to show me around their Broomfleet plant. Because here, on the rich clay beds beside the Humber estuary, Sandtoft have invested heavily on making large format clay interlockers. Or what they like to refer to as their New Generation clay tiles. Sandtoft’s aim is to build market share for clay in an area of the roofing market which has up till now been solid concrete. Their hope is that they can squeeze the cost differential down to just 10-15% and that way persuade builders that the benefits of clay are worth paying this little extra for, just as happens in the brick market. It seems like a good bet, but the timing could have been better. One problem is that the big housebuilders are currently cutting back on everything they can think of and not only are they currently unreceptive to new ideas but the very faces they negotiate directly with keep disappearing as staff cuts begin to bite. Another is the Broomfleet gas bill: despite all the many green credentials which clay enjoys over concrete, it does require firing for three days in kilns with temperatures around 1000°C. Generally, it’s not a great time to be a building materials producer. Costs are up, volumes down, payments late or frozen. But Sandtoft’s position is better than many, and the family’s decision to sell a majority stake in the business to Austria’s Wienerberger at the beginning of the year, partly in order to fund the expansion into clay roofing, must now look like a splendid deal indeed.